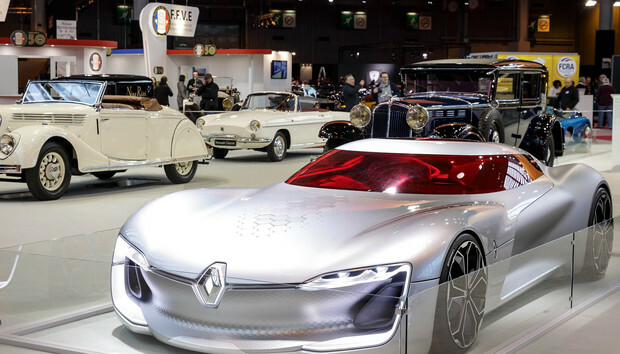 Renault is making electric cars look good. The French automaker's Trezor electric coupé has a low, wide body that resembles a stalking predator, and given that it goes from 0 to 100km/h in less than 4 seconds, the prey won't be able to run very far. The vehicle borrows its electric motor and regenerative breaking system from Renault's Formula E racing cars and runs on two batteries, each with its own cooling system. Renault's Trezor concept sports coupé. In true Parisian style, the car's interior was designed with romance in mind. Everything from the windshield to the leather seats, and even the wood trimmings is red. According to Renault, the Trezor is supposed to remind you of falling in love. As with all futuristic cars now days, the Trezor can be operated in three modes: neutral, sport, and autonomous. While in autonomous mode, the wheel will actually expand in width, to create a bigger screen on which the driver can enjoy a movie. As a concept, the Trezor isn't likely to end up on the road, but maybe some of its features will trickle down to Renault's production cars. Just maybe not the blazing red interior.